LAUGH AT FIRST SIGHT is a stand-up comedy spectacular, featuring four of South Africa’s comedy heartthrobs, Dave Levinsohn, Kate Pinchuck, Lazola Gola and Nina Hastie, which will premier on BoxOffice in Febuary 2019. Laugh at First Sight is part of The Live Series – a stand-up comedy series performed and recorded in front of a live audience. Laugh at First Sight will be the tenth stand-up comedy special produced by The Live Series! 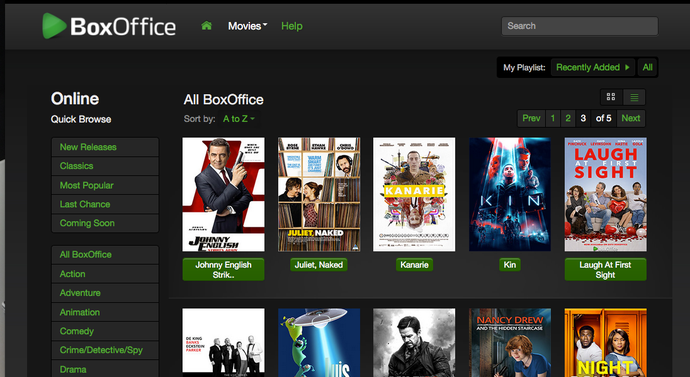 BoxOffice Online is South Africa’s first online movie rental service. Get access to some of the biggest Hollywood blockbusters, a fresh Bollywood catalogue and the latest local releases directly to your PC or Mac. Movies are available for streaming only. BoxOffice Online is an online movie rental service that is available to anyone in SA. You must have a DStv Connect ID and a BoxOffice Account, which you can get by signing up on the BoxOffice Online website or on www.dstv.com/boxoffice. All BoxOffice Online customers have access to a larger catalogue of movies that include from New Releases and Classics. BoxOffice on the PVR is available only to DStv Premium, DStv Extra and Compact PVR customers residing in South Africa or Lesotho. A catalogue of up to 15 New Release Blockbuster movies is available with some of the movies made available the same day as DVD. Movies are available in Standard Definition and High Definition on the respective PVRs. The movies are pre-loaded into your PVR and are available for you to rent and watch instantly.